Workshops include: Arts * Game * Kitchen * Beat Box * Computer * Drama. The story of a kindred spirit who sought Jesus by night. John 3:1 tells us Nicodemus was a "Pharisee" and "leader of the Jews." Why is his night visit significant here? In John 2, Jesus has just finished making a big scene, turning tables upside down in the temple and whatnot. Church types are definitely keeping a watchful eye on him. The Canadian Oxford Dictionary defines a Pharisee as: "a member of an ancient Jewish sect, distinguished by strict observance of the traditional and written law...."
Canadian scholar Northrop Frye provides an excellent contextual explanation of the figure of Nicodemus in a sermon called, "A Breath of Fresh Air," in the collection Northrop Frye on Religion. He writes this "is one of the few places in the Gospels where Jesus is shown directly dealing with the imaginative needs of an educated person. Nicodemus is a cultivated, intelligent, tolerant member of the Sanhedrin or Jewish council who is fascinated by Jesus, and wants him to have at the very least a fair hearing." What's all this about spirits being born anew? So what does being born from above really mean? Here's Frye again on this question. "The thing which is most difficult for Nicodemus to do is precisely what he is being challenged to do: to turn around and look his own cultural conditioning in the face... [The 'womb' Nicodemus speaks of] is the body of assumptions he acts on without examining." In the quotation above, Frye uses the expression "to turn around." This phrase links Nicodemus's night visit to the theme of repentance. From there, this story also becomes linked to the body of reversal images and symbols that surround Jesus's life and teachings, as well as those that introduce and conclude this story. In these phrases, "the wind blows where it chooses…but you do not know where it comes from or where it goes. So it must be with everyone who is born of the Spirit" (NRSV), Jesus connects wind imagery to this discussion of spiritual matters/kingdom of God. Frye again provides helpful detail on this concept: "This world of air and light is what Jesus calls the kingdom of heaven. It is a world of the spontaneous freedom, the independent power of action, which the image of wind suggests. No such power is possible except on the basis of love, and the New Testament constantly insists that love and freedom are the same thing." "For God so loved the world that he gave his only Son, so that everyone who believes in him may not perish but may have everlasting life" (NRSV). In the story of this night meeting between Jesus and his intellectual peer and fellow student Nicodemus, readers can perhaps catch a glimpse of this liberating world of air and light. Frye goes into more depth about matters of the spirit in another excellent piece, well worth reading, called "To Come to Light," in the same collection: "The wisdom books tell us that knowledge is the road to wisdom, and that wisdom is one of the most serious goals in life. At the same time it's constantly associated with the highest kind of pleasure. The Book of Proverbs speaks of wisdom as "playing" throughout the earth; the Book of Wisdom itself says that in the friendship of wisdom there is "pure delight." A uncommon bond, at any rate, must account in part for Nicodemus's reappearance near the end of John's gospel (19:39), when he shows up with a costly bundle of embalming oils as Christ's body is taken down from the cross. From The Book of Wisdom 8:16 - 18. 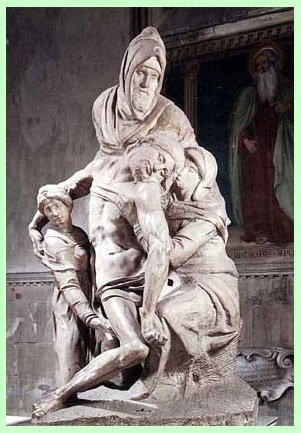 Here's a link to the famous sculpture by Michelangelo of Nicodemus with the body of Christ. Find also here an informative essay on the sculpture. • Describe the kind of man Nicodemus was. • Were his questions for Jesus good or reasonable ones? • Have you ever felt you needed to ask a 'silly question' from someone you admired or respected? Did you ask it or chicken out? How would you handle it next time? • What does being 'born from above' mean to you? • Why did Nicodemus visit Jesus at night? • What do you think is the significance of wind in this story? • What does everlasting life mean to you? • Is this night visit the last we hear of Nicodemus in John's gospel? Arts -- make own fuzzy felt boards. Why: to reinforce main characters and plot points of story. **My main idea here was to have dark felt for the story board and lighter coloured pieces for the characters -- you know emphasizing that whole light and dark thing! Instructions: Give each child a big piece of felt (or even flannelette) for 'story mat.' About 18 inches wide by 12 tall would be good. Then craft main chars on felt scraps with pencils. Of course there are only technically Jesus and Nicodemus in the story. But you can populate your board with any number of night animals -- owls, bats, raccoons, etc. How about nosy neighbours eavesdropping on the conversation? Older children can sketch and cut their own. Younger children can attempt to sketch, but teachers will cut out the figures. Try a cereal box template to cut a few Nics at a time. Why -- to emphasize the whole happening at night element of this story. Background -- Nic 1 Kitchen made night sky cookies (choc cookie with white choc chips). My daughter still talks about these as her fave kitchen lab ever. So I have not strayed far from a good idea. With the brownies, you can still point out that the white chips are the stars in the night sky. - Heat oven to 350°F. Grease 13 x 9 x 2-inch baking pan. - Beat eggs in large bowl until foamy; gradually beat in sugar. Blend in butter and vanilla extract. - Stir together flour, cocoa, baking powder and salt; add to egg mixture, blending thoroughly. - Stir in white chips. Spread batter into prepared pan. - Bake 25 to 30 minutes. Let cool. Cut into bars. Try this variation of Hide and Seek. Remind the children why the two men had to meet at night. Book the church hall for the morning. Maybe prior to class, set up some large obstacles for kids to hide behind. Dim or turn out the lights to give that secret night meeting feeling. Take turns being Nic & Jesus. Beat Box -- make up rhythm routine based on the story. a. practice separately in groups first. b. practice together, all doing each others parts. c. practice as in a round. Grp 1 starts, then does Grp 2's part, ending with Grp 4 doing its part last. d. work it up well enough to present during worship service or to another sunday school class. - Have them animate the conversation in KidPix. - Draft a quiz based on this text in the 3D Jericho program. There's a great book out there called Shadow Games by Klutz/Chicken Sox. These kinds of puppets could be easily adapted to the Nic's Night Visit play from Nicodemus 1. Materials: Cereal boxboard, craft sticks, glue, flashlight, stage, pencils, scissors, xacto knife. From 1 big piece of cardboard make a simple stage (ie draw wiggly lines for curtains across top and at sides. Design puppets on boxboard with pencils. Where possible, add lots of cut outs for eyes, etc. Shadow puppets look really good with cut away bits. Teacher will have to help with this using xacto knife. Super glue or glue gun figures to craft sticks. Actors crouch below light of flashlight until their part comes up in the script. Then pop the puppet up in front of light so its shadow lands on stage. You make have to create several 'casts' as it may get crowded crouching under the flashlight. That's ok. You can put on the plays for each other. Click here for the scripts.